Weâ€™re planning a “disaster dinner”, and weâ€™d love you to come!Â Â The first annual Sunnyside Disaster Dinner on Saturday, March 10th, 3-6pmÂ is a community information event and fundraiser organized by the Rock-n-Roll Committee of the PTSA (aka the Emergency Preparedness Team). While we’re warm, safe and dry, let’s learn about and practice emergency skills and enjoy getting to know each other in the process! 3-4:30pm Free Information Booths and ActivitiesÂ â€“Â Free and open to the public, this portion of the event will provide information and activities about emergency sanitation, water harvesting and filtration, creating your home emergency kit, and block organizing.Â Â There will be fun activities for young people including Fire Engine 9 to explore! 4:30-6pm Dinner and EventsÂ â€“Â At 4:30pm, ticket-holders will enjoy a simple (and delicious!) dinner in the SES cafeteria to be cooked by neighborhood volunteers in an outdoor â€œemergency kitchen.â€Â Â During the dinner, weâ€™ll have a few short presentations on school and neighborhood emergency readiness, a fun drill, a raffle of a home emergency kit, festive games, and an eclectic â€œDisaster Playlistâ€ for ambiance. Get your Disaster Dinner ticketsÂ for $5 -$15 sliding scale (children under 5 free) on-line or in personÂ at Sunnyside Environmental School M/W/F mornings 8:30-9am.Â Â And pick up a raffle ticketÂ for only $5 (or 5 for $20), to win an excellent home disaster kit with food, water, first aid, flashlight, and many other necessary items in a sturdy box. 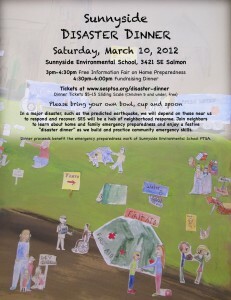 All proceeds from dinner and raffle ticket sales go to support the emergency preparedness work of the PTSA. In a major disaster, such as the predicted Cascadia megathrust earthquake, we will depend on those around us to respond and recover.Â Emergency responders and city services will be overwhelmed.Â If an earthquake or other major disaster were to happen during school hours, it is likely that neighborhood residents and businesses will be the first responders.Â In addition, the school will be the hub of neighborhood gathering and organizing, where important neighborhood-based services can be delivered.Â For Sunnyside School and the surrounding neighborhood to respond effectively, we need to educate ourselves on home and family preparedness, build more skills for emergency response and recovery, and develop strong relationships with our neighbors.Â Please join us for this important and fun event!